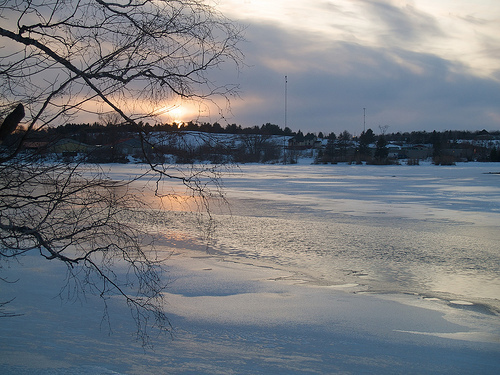 We’re at the cottage this weekend, taking advantage of the new Family Day holiday Monday to enjoy the calm, relaxing settings on a thawing Gull River. It is super sunny this weekend so after I change out of my jammies I just might have to go for a walk. Zeus and I were already out earlier for a constitutional, and again we saw the colony of wild turkeys that lives just up the hill in the bush. One of the locals feeds them so they are always around. They’re surprizingly large, charcoal black in colour and quite noisy. Oh and they can also fly fairly well, although sometimes I don’t think they give a lot of thought to landing, because one of two of them crashed their way into the trees. Turkey’s aren’t known for their brilliance after all. 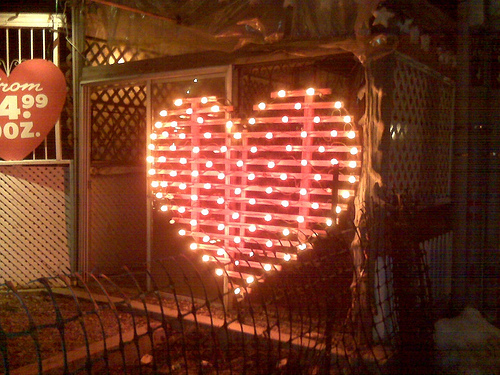 We went out to Terroni on Friday night to celebrate Adria’s birthday (which happens to be Valentine’s Day). I’ve never been there before but you can bet I’ll be going back. They have the most incredible selection of cured meat and cheeses, including a locally made procuitto, and they make spectacular thin crust pizzas. The location we went to is a newer one, in an old bank I think, on Adelaide Street just east of Yonge, and the decor is phenomenal. In the basement they have more seating and gorgeous wine cellars with jail gates for doors. I made Adria some arm warmers for her birthday, and they were a HUGE hit. I used a mystery yarn that I got at a yarn swap a few years ago. I think its a wool blend, but its very soft and squooshy. I also added beading to them which totally dresses them up. 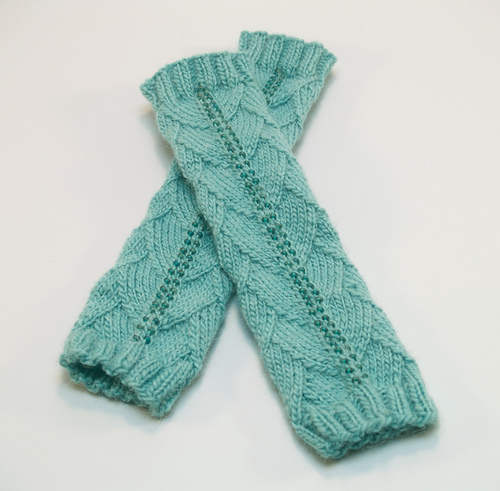 The pattern is Dragon Scale Gauntlets by Annemarie Pearson, and they were a super quick knit up – I made them in about two days. This is the first time I’ve knitted with beads, so it was a bit of a trick to learn how to place them, but I figured it out. The only thing is that the beads are all on the same angle (right leaning), whereas it would have been a little more symetrical if the left side was leaning to the left, but I’m still very pleased with them. 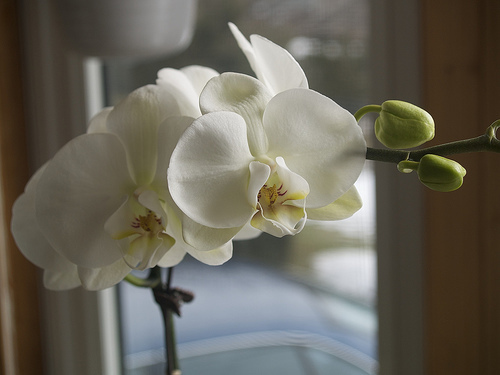 Finally, I have to give props to the boy for my Valentine’s Day present – a lovely white phalaenopsis orchid! I have one very similar to this already but it hasn’t been doing well for some time. It was very happy for many years, but ever since I moved from my Carlton Street apartment about 5 years ago, it has suffered from a failure to thrive. And considering Chris already thinks I have WAY TOO MANY plants, to give me one for Valentine’s Day is really something!